In 2010 M&B Hangers went pink. 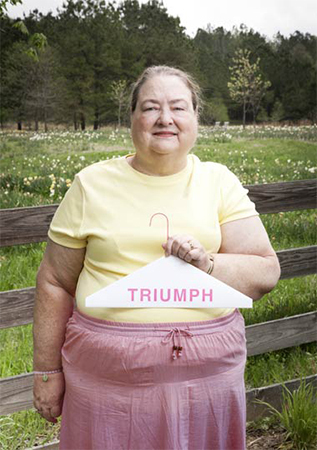 In our desire to do our part to fight for the cure for cancer, we introduced our inspired line of pink hangers. Our associates, our family, and our customers have all been touched by cancer in some way. Some have lost the fight, and some have won the fight. Clearly a cure must be found. And this motivates us. 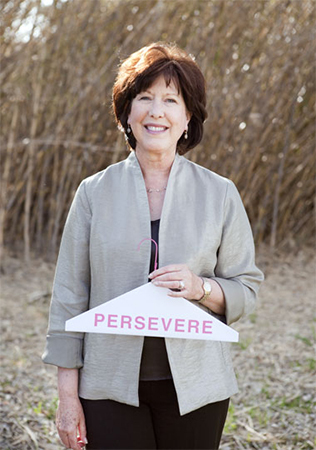 Each pink hanger displays a word to inspire. To communicate messages of hope, perseverance, courage, and triumph. 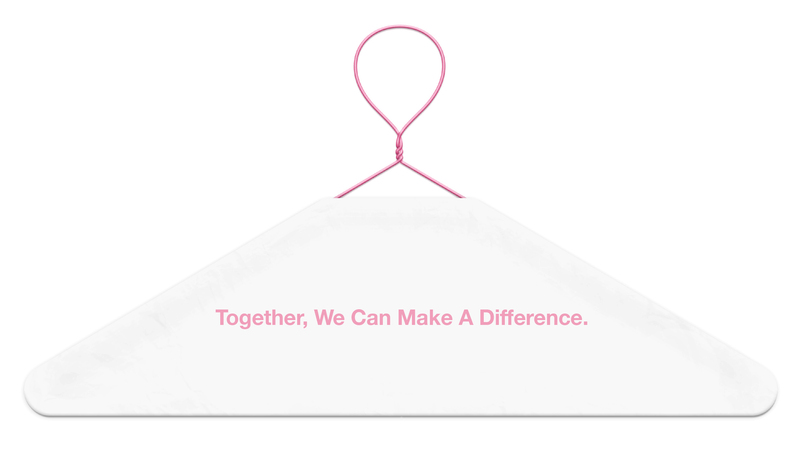 With the purchase of every pink-caped hanger, M&B makes a donation to the American Cancer Society. Together with our customers and their customers, we can fight cancer. Together we can make a real difference. 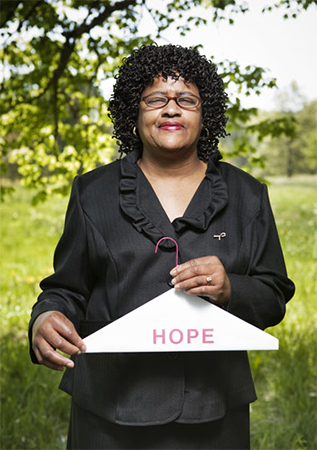 Learn more about our Pink Hangers. Rachel Ragland was diagnosed with breast cancer 17 years ago. It was a tough fight, but Rachel had a lot of encouragement from her friends and family. Today, she talks to young ladies about staying healthy and being in sync with their bodies. It’s important to help others be aware of the signs. “I’m not here on this earth for just me,” says Rachel. Recently, an old diary she kept during her treatment was found. “When I read it, it made me realize how blessed I truly am,” Rachel states. 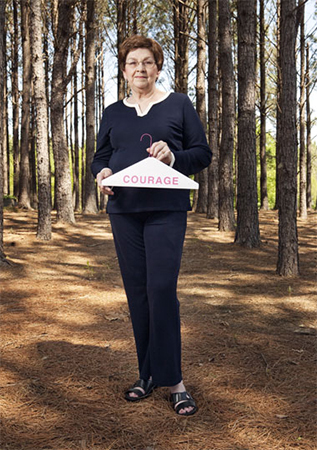 Cindy Gore has been a breast cancer survivor for six years. Her seven grandchildren keep Cindy young at heart. She learned that when faced with cancer, the secret is to remain positive. “You can do it. You can get through it. They have come so far in understanding and treating cancer,” says Cindy. Reflecting back on the treatments, a strong faith was crucial. “I realized that in going through cancer, there was only one set of footprints in the sand. I was not alone. I was carried the whole time,” says Cindy. Pat Washington was diagnosed with cancer three years ago, and the fight continues. Pat realized that she was stronger than she thought she was. Cancer can be frightening, but Pat is a believer that you have to maintain your faith and a sense of humor to sustain the fight. Pat has an amazing support system, and many people are praying for her. Even Pat’s surgeon prayed with her before surgery. “I had such a sense of calm and confidence after that. It made all the difference,” says Pat.